In addition to making order out of chaos as Massachusetts regiments went off to war, Gen. Schouler (1814-1872) rocked some serious whiskers. Not all generals achieve their victories on the battlefield. William Schouler, Adjutant General of Massachusetts during the Civil War, achieved heroic accomplishments primarily while sitting at his desk in a corner office of the State House. He is a tremendous figure in Massachusetts history. And, sadly, all but forgotten. These past months, we have been in the midst of the 150th anniversary of the great wave of Massachusetts’s 3-year regiments going off to the Civil War. When reading up on the formation and training of these units, one continually encounters Schouler at the center of it all. Imagine the chaos, the wild enthusiasm, the political jockeying for position and power as these thousands of soldiers formed into regiments. And one man in charge of mediating all this. 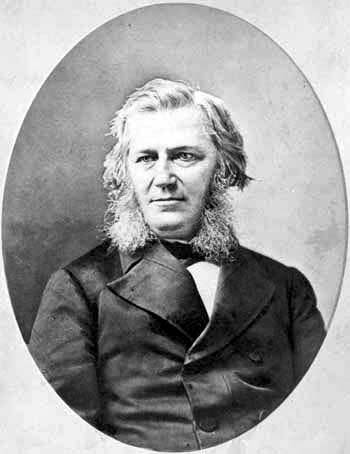 Schouler was born in Scotland in 1814. His parents brought him to the U.S. at a young age. He grew up mostly in West Cambridge. His father ran a textiles business in Arlington–a business in which several of his brothers became involved. But William had different ideas. He wanted to be a newsman and bought the Lowell Courier. While editor there, he also was elected to a term in the Massachusetts General Court and served on a committee to investigate the working conditions of the Lowell mill girls. He eventually moved on to becoming editor of the Boston Atlas in 1847. Under his leadership, the Atlas became one of the leading Whig newspapers in New England. Schouler also took an interest in the peacetime militia, became involved and, before long, was promoted to Colonel. From 1853 to 1858, Schouler and his family lived in Cincinnati while he ran the Cincinnati Gazette. Gov. Salmon Chase, recognizing Schouler’s experience with state militia, appointed him Ohio’s Adjutant General, and Schouler set about putting that state’s militia regiments in order. In 1860 he was back in Massachusetts. Gov. Nathaniel Banks appointed him Adjutant General of the Massachusetts Militia. When Governor John Andrew took office in January 1861, he kept Schouler on, recognizing that he meant business. Together, Andrew and Schouler would work “heart and soul” (according to Schouler’s son) to prepare Massachusetts for war. It is no accident that Massachusetts troops were the first to respond to Lincoln’s call of April 15, 1861. When he took the post, Schouler ended the system of “perks” that his predecessor had enjoyed. Contractors wishing to do business with the Adjutant General’s department were in the habit of liberally spreading around cash and other gifts. Schouler accepted these, but instead of pocketing them, he put them directly into the State Treasury. Officials marveled at how the Adjutant General’s office suddenly managed to generate such income. When contractors realized where their money was going, they stopped the practice. Schouler had absolutely remarkable political abilities. Dramas large and small unfolded as regiments came together. His logistical responsibilities in outfitting and arming these men, while massive, probably paled in comparison to task of smoothing egos, resolving disputes, calming Captain So-and-so because his company was supposed to go with the X Massachusetts Infantry but instead was being assigned to the Y Massachusetts Infantry and the men of the company were threatening to go home, or dealing with Generals Burnside and Butler who were laying claim to various regiments either formed or forming. In 1864, Schouler played a significant role in the famous Bixby letter episode. In the summer of 1864, Mrs. Lydia Bixby knocked on Schouler’s office door to show him five letters she had received from different commanders over the past two years notifying her, one by one, that her five sons serving in the war were dead. Schouler was so moved by this that he reported it to Gov. Andrew. Andrew, in turn, wrote the War Department, asking for a special letter from President Lincoln for the Massachusetts woman who had suffered such unimaginable loss. The letter by Lincoln is lauded as one of his most brilliant works and a touching summary of the sacrifices endured by mothers and wives during the war to preserve the Union. The letter was sent to Schouler to deliver personally. Recognizing its significance, Schouler had it copied for future publication, then brought it to Mrs. Bixby on Thanksgiving with a dinner and a gift of cash from the people of Boston. The Bixby letter was a key plot device in the movie Saving Private Ryan and, more significantly, was read by former President Bush during the 10th anniversary ceremony of 9/11. There were roughly 15 training camps established across the state to prepare raw recruits for war. The camp in South Lynnfield was named Camp Schouler. I belong to a reenactor group which represents a company of the 22nd Massachusetts. 150 years ago this month, the men of the original 22nd Mass were at Camp Schouler, busily drilling. Today, the sprawling junction of Route 128 and Route 1 covers much of the site. The rest is covered by restaurants and a hotel. I don’t know if there is a marker on the site to designate the spot where thousands of men trained and from which they departed for the front. I don’t even know if it’s worth placing one. But I plan to go look at the area in the near future. During the war, Bostonians often remarked that, as they were going about their business in the evenings, walking down Beacon Street, a light could almost always be seen in the window of Schouler’s State House office. I imagine that must have been a comfort. I am not aware of any monument, memorial or plaque to Gen. Schouler. If there is not one, there ought to be.